If I named this tablescape, I guess I'd call it "french country meets retro american" ...that's an old French wire market basket in the center, filled as if the hostess had just returned from Market Day mixed with vintage and new Fiestaware pottery. I paired the fiesta with 1960's blue pressed glass goblets (a hand me down from my mom that she will likely now threaten to take back!) and linens with a polka dot and spiral motif. The place mats are more traditional and the napkins are a bit more modern. Sometimes the mix works and sometimes it doesn't. I try mixing things up until I like what I see. This mix is special to me...I think because my attraction to the two styles, retro american and french country both represent different periods of my life. I love this integration of the two. I tried replacing the market basket with an old galvanized metal scoop or dipper. I also swapped the place mats and pottery out. I love how the scoop looks as a centerpiece filled with lemons! Here's the flour bin filled with lemons, accompanied by Michael's grandmother's chicken salt and pepper shakers. Got them for my birthday last year! Love them. I think this tablescape needed a bit more work though...maybe a burlap feedsack runner? 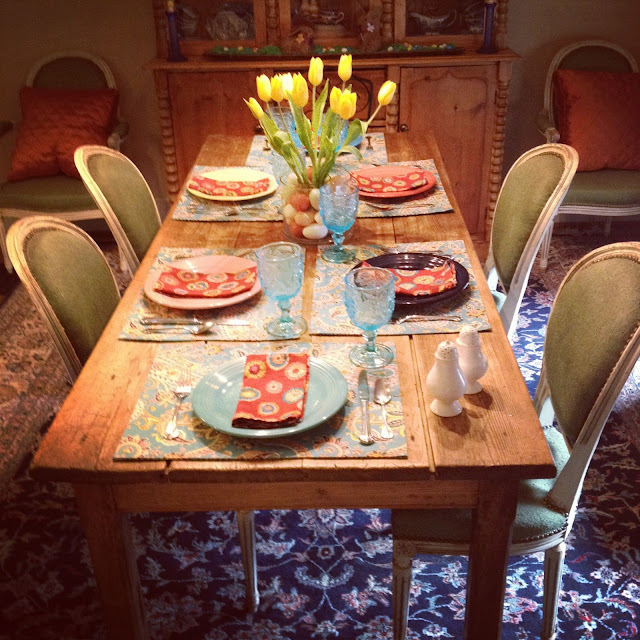 This was a spring table I put together for Easter. I use the same things over and over...just changing a few elements...that really is necessary when you are a cottage dweller. Space is at a premium so things must be able to be used in many different ways. Sometimes my life feels the same...time is at a premium so the ways I choose to spend it really need to do double or even triple duty! 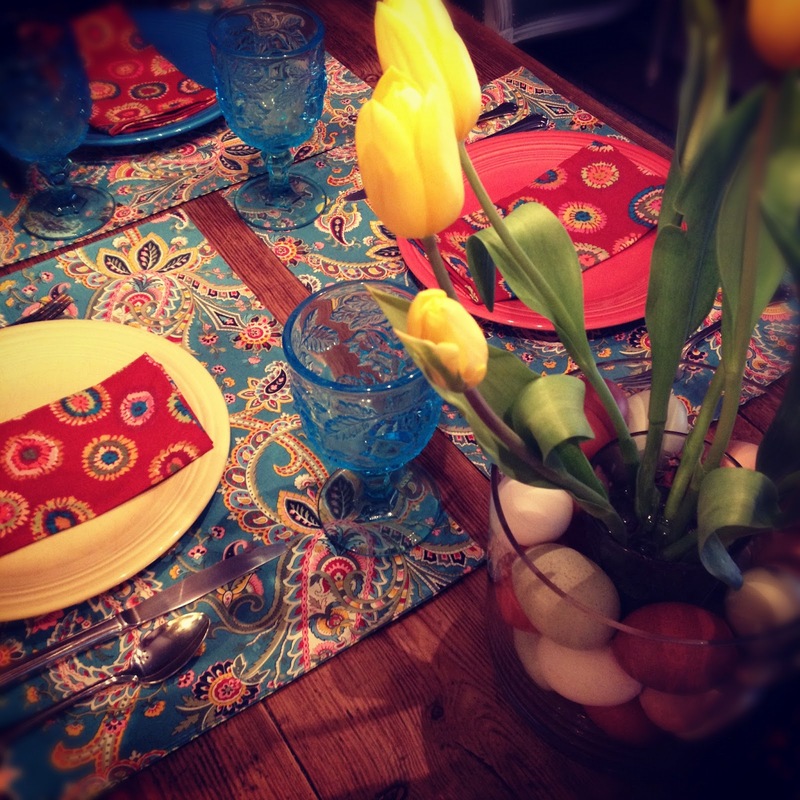 I did not expect those napkins to go with the paisley place mats but when I tried them together, I liked the combo. Sometimes my life is like this...I don't expect elements to go together but unexpectedly, they do! When I am playing with my creativity, it is helpful to have "beginner's mind" instead of "expert mind." I never know if something will work until I try. I've read that if you desire to foster creative impulses, it is important to allow yourself time to play. Often, when we attempt to be creative, we put a tremendous amount of pressure on ourselves because we are focused on the outcome. It is important, if your goal is to foster creativity, to allow yourself "play time" with no attachment to outcome...like a child. When is the last time you had a play date with yourself? You might consider treating yourself to a trip to your junk store or art supply store soon....or just stay home and play with the toys you already have. You might be surprised how restorative a play date with yourself can be. I always am. Very nice, Lisa. I love to use my things in different ways, too. Thanks for sharing! in clover: interest in pinterest?